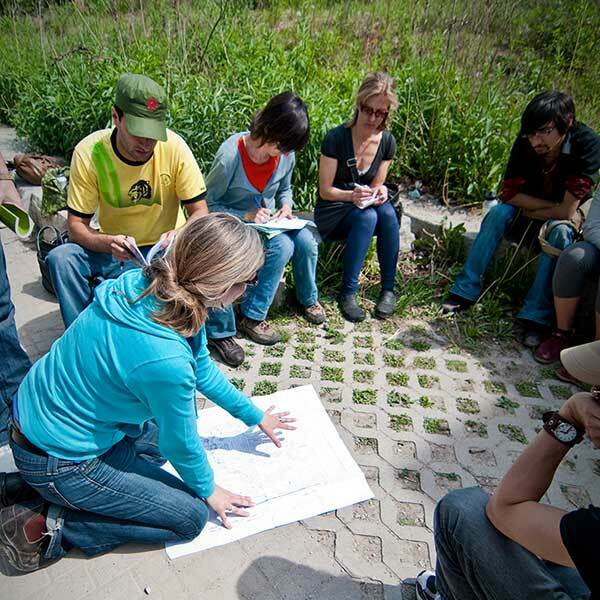 In the summer of 2010, the IwB conducted a charrette looking at potential new greenhouse and chicken coop designs for Evergreen Brick Works, a community environmental centre and a public nature conservation area in the heart of Toronto’s Don Valley. For most of the 20th Century, this site was a brick processing plant known as the Don Valley Brickworks. In the 1990s, the site began to be revitalized. The conservation and park areas were open to the public in 1997. The industrial part of the site was set to open for public use in 2010. 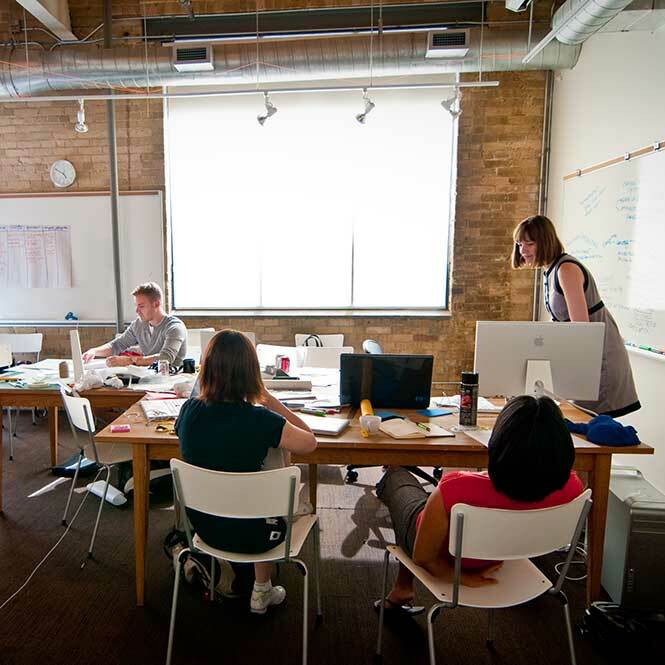 At this time, Evergreen, the Canadian charity that took on the programming of the former Brickworks Plant, approached the IwB to help brainstorm programming uses for the new site, including ideas for a children’s greenhouse and a chicken coop for the centre. With Evergreen, the IwB ran a 3-day charrette to help develop new concepts for these potential uses at the new Evergreen site. To promote urban agriculture and public knowledge about urban ecology at the new Evergreen Brick Works centre by designing a greenhouse and chicken coop to teach kids about agriculture. Educating kids about the fragility of our ecosystem and the need for preservation and communal care of our natural urban oases, such as the Evergreen Brick Works, is of utmost importance. Evergreen Brick Works is a unique environmental and community centre in the heart of Toronto that offers interactive workshops and community festivals, and offers a range of programs combining ecology, design, technology and the arts. This leading green design and urban sustainability centre is managed by Evergreen, a national charity that was established in 1991. The centre is located in the heart of Toronto at 550 Bayview Avenue, adjacent to the ravine that connects to the Don Valley River. The site used to be the Don Valley Brickworks plant, which was in operation from 1882 to 1984. After the plant closure, 16 heritage buildings and a 16-hectare park reminded that included wetlands, hiking trails, and wildflowers. The area was sought after for residential development, but was eventually acquired by the Toronto Region and Conservation Authority (TRCA). From 1994, the area began to be restored. The former brick plant quarry was converted into a city park in order to help restore the wetlands after years of industrial pollution; the park is managed by the City of Toronto. Beginning in 1997, Evergreen began restoring the historic heritage buildings into an environmentally-focused community and cultural centre. By 2010, the revitalization of the site was in its last phases, but there were still a lot of questions about what the site would look like and what programming it would offer to visitors. Evergreen sought the help of the IwB to propose new programming ideas and specifically come up with concepts for a greenhouse and chicken coop that could be added to the restored site. Five charrette teams were given the task of proposing designs for a children’s greenhouse and a chicken coop that could be integrated into the planned site renovations. Children’s leisure activities have drastically changed in the last couple of decades. More and more time indoors, interacting with digital media, and less time playing outdoors has meant a larger fragmentation between kids’ knowledge and appreciation of the natural world. 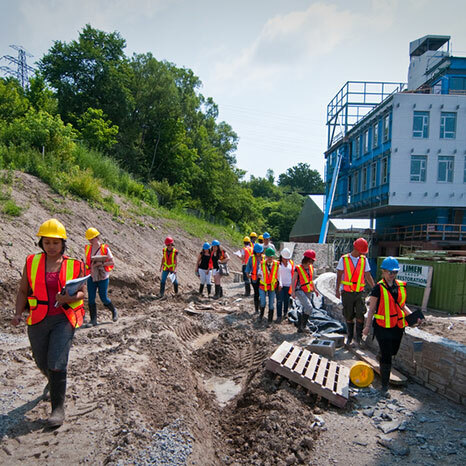 Evergreen’s mission is to restore nature in urban environments and empower Canadians to take a hands-on approach to improving the health of their cities. The Evergreen Greenhouse Charrette stressed the role of young Canadians in this process, who need to understand and experience the potential of a more balanced urban ecosystem. All the charrette teams’ greenhouse designs included a year-round facility that supported educational programming for kids on urban farming and agricultural practices and produced food that could be used in the adjacent educational kitchen and onsite restaurant. The chicken coop designs were proposed to house chickens year-round and allow children to interact with and learn about keeping chickens and egg production. Factors that were consider during the design process included: the physical site constraints such as boundaries, location of existing buildings, user needs such as different anthropometrics for children of varying ages, accessibility, sustainability of materials and processes, safety, security, and programming options. For more information on this project, see the charrette teams final presentations, which are summarized and available for viewing below. The Living Classroom is a design proposal that suggest that nature is a model for educating children. Here the greenhouse design uses biomimicry in the design and operating system of the greenhouse to engage and educate children as they interact with the space. View the Team 1 Final Presentation here. Team 2 designed a greenhouse in which children could interact in an holistic and immersive educational setting that inspires a sense of wonder. Here learning and connecting to the natural cycles of life is represented through the structure of a tree house. View the Team 2 Final Presentation here. View the Team 3 Final Presentation here. Nature’s Playground is a proposal for an exciting, interactive greenhouse and chicken coop ecosystem that allows children to explore the relationships between themselves, plants, animals, insects, water, and earth. View the Team 4 Final Presentation here. A proposal for a greenhouse where kids want to play with their food. To play with it, they need to grow it themselves. Through playing and participating, children can nurture a garden of their own while learning the importance of plants and animals in the ecosystem. View the Team 5 Final Presentation here.